Hope all the Trick or Treaters out there have a ton of fun and get lots of Candy, candy, candy, candy!!! I'll be Casey Jones this year and my son is Raphael. The girls are going as Wonder Woman, Batgirl and Supergirl! What are you dressing up as? Happy Halloween! I recently found this old Raphael Ninja Turtles Halloween mask in a storage box at my house. My son had the new "Nickelodeon" mask from last year's Halloween festivities! So, why not put them together and see which is best! 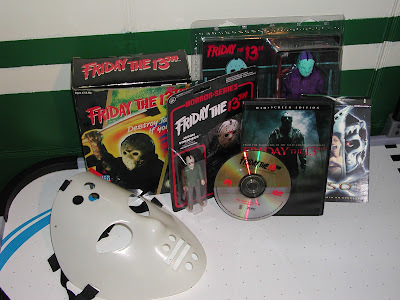 Let's start with the 1989 mask. 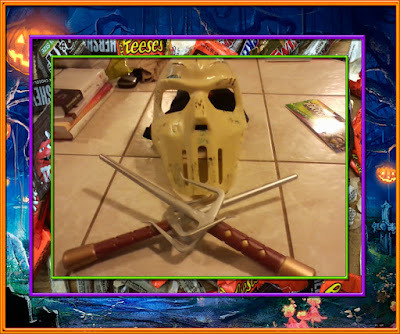 I love the vintage look of this mask! 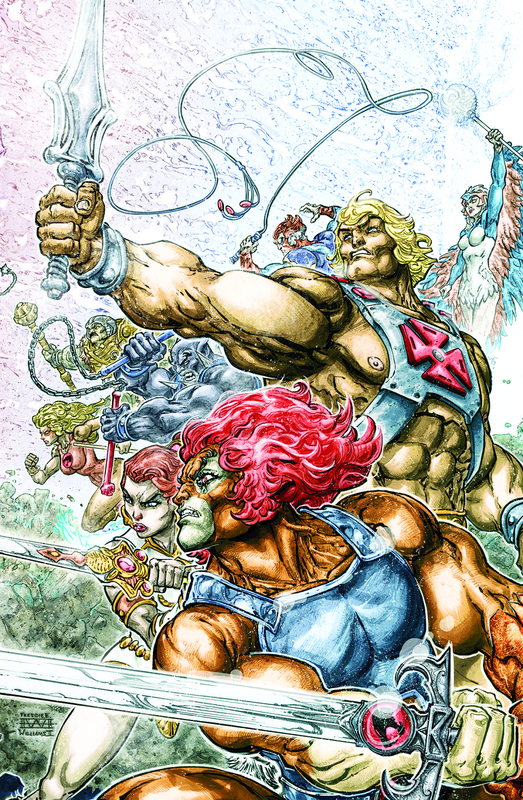 The snarl is close to resembling the expression from the original Playmates toy line and the colors are bold and vibrant. My only complaint is that the material the mask is made from is pretty flimsy. This could easily be cracked or broken by a young child. On the plus side, the elastic string that holds the mask to your face is still very strong and holds the mask in place nicely! Onto the 2013 mask produced by Ruby. 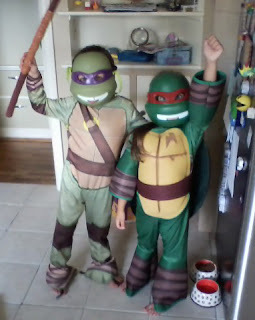 I am not the biggest fan of the Nickelodeon Turtles look. It is okay don't get me wrong, but you just can't beat the classics. The hard plastic of this material is a definite upgrade from the 80s version and much more durable. My main issue is the Velcro strap that holds the mask up. It really is not adjustable and the Velcro weakens after a few wears. I am a much bigger fan of the Turtles of my era and if it were up to me, I would choose the 80s mask over 2013. But, damn don't those kids look RADICAL all decked out in their costumes? "THE RETURN" part one! Terry McGinnis is back as Batman, much to the delight of his family and friends. But is the original Joker really back as well? 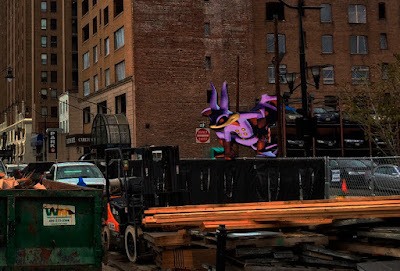 Inspired by the possible return of their role model, the Jokerz have taken over an entire section of Gotham City and are determined to wreak havoc in the still-rebuilding city. 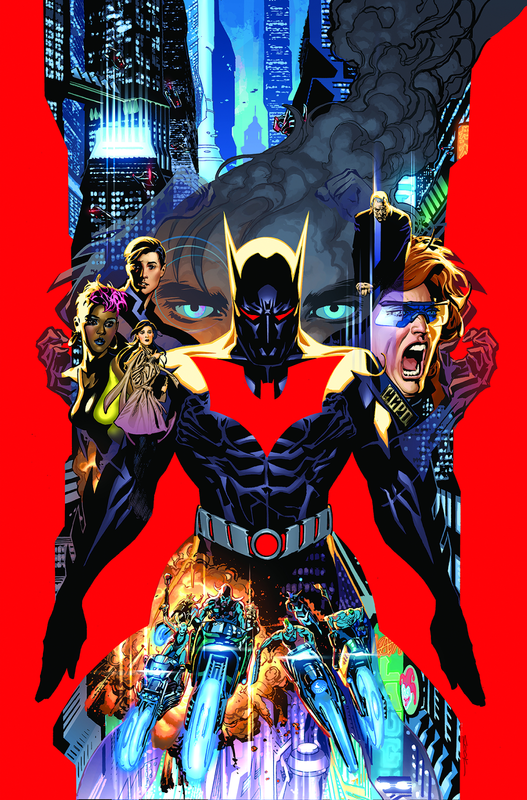 While Batman battles chaos on the streets, his friend Dana is at the mercy of the new leader of the now-unified gang. 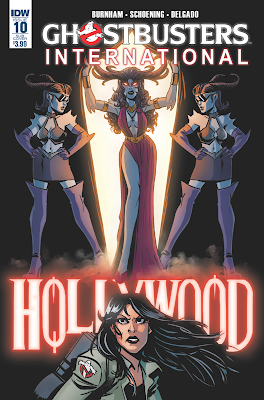 The Halloween fun continues with this week's Pop Culture League Challenge topic: Here comes Halloween. It's The Most Wonderful Time of the Year! At an early age I learned to never take Halloween or Trick or Treating for granted. Here's what happened to bring me to that realization. This is the story of the year Halloween never came and it all starts with a Double Dragon Tiger Electronics Handheld game! 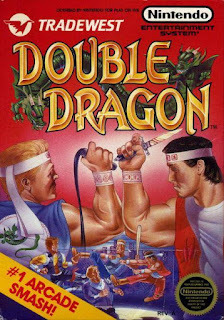 The year was 1988 and Double Dragon was the hot video game. 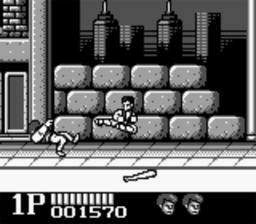 We all had dreams of leading elite heroic martial artist Billy Lee through the rough streets to save his girl Marian from the Shadow Boss! 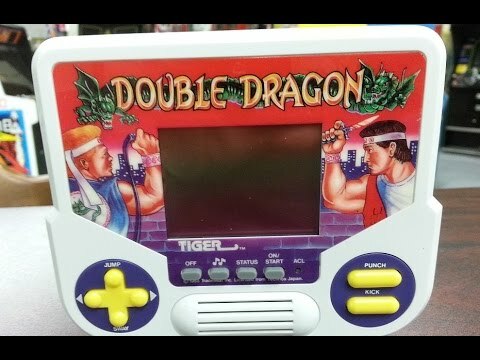 I owned the NES version and played the arcade cabinet, but when I was introduced to the Tiger Handheld version by a friend in school...my world was rocked! HOLY CRAP!!! 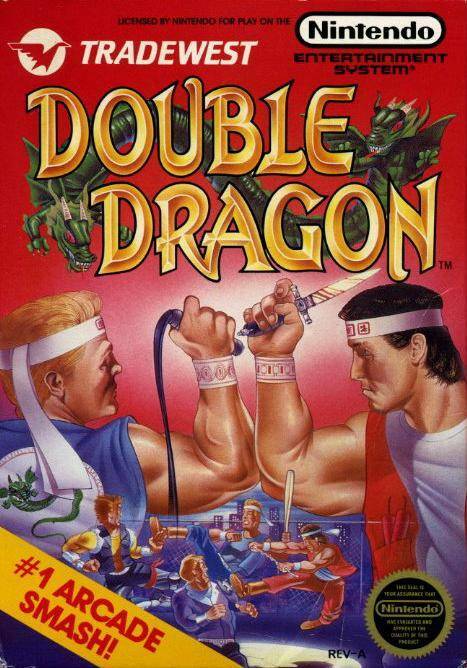 You could play Double Dragon anywhere you wanted? No more cables or having to be planted in front of the TV? Glorious!!!! I had to play it! My friend brought the game to school and let me play during lunch, but as lunch was about to end, he pulled it from my hands! 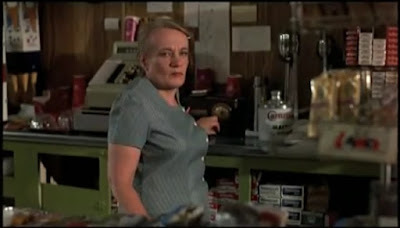 Almost as if I was channeling Billy Lee himself I started a fight and was sent to see the principal. Looking back this was so dumb to get in a fight over a Tiger game, but this was a year before the Gameboy was released and I had never seen anything like this before. I needed more of my portable game fix and I must say it made me temporarily crazy. Needless to say my Mom was called and her punishment for me was to stay home on Halloween and give out candy to the kids that came to our house! Worst punishment ever! Not only would I not get any candy, but I had to watch the stupid smiles on the kids faces as they walked away from my house with my candy treats! That year I was going to be Ray from the Ghostbusters and my brother was Peter. 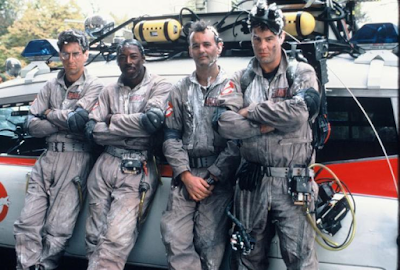 We had the Proton Packs, the tan jumpsuits with iron on Ghostbusters badges and we picked out the biggest pillow cases to collect our goodies. Those dreams of Halloween glory were all blown in one damn lunch period. I can't say that I never did get into another fight over video games, but I will never forget that Halloween and the lesson it taught me. Thanks Mom! The Toy Box shows off Nightmare series 2 Re-Action figures! I make it no secret that I am a huge Ghostbusters fan! 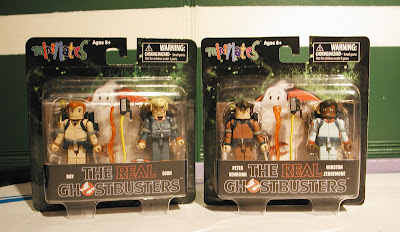 I have a nice collection of figures ranging from loose Real Ghostbusters figures from my childhood to the Stay-Puft balloon figure from this years reboot. The MiniMates series though, are near the top of my collection list. These guys are AWESMOME. 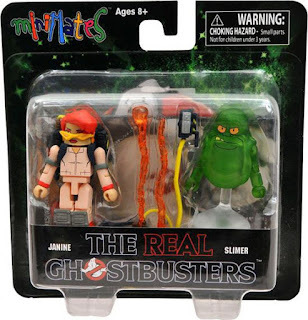 I like the sculpts and the added accessories like the proton beams and ghost traps. Yes, I do keep them in the package. Some people like to take them out, and that's okay. 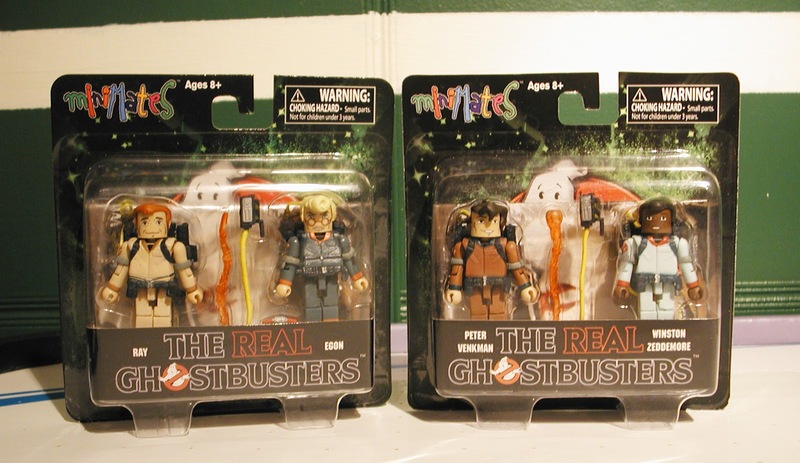 I respect your collecting preferences, but the packaging on these guys is too cool to rip open. Look at the face on Ray, he is so full of joy and optimism! And Egon, he is the opposite, focused and serious. 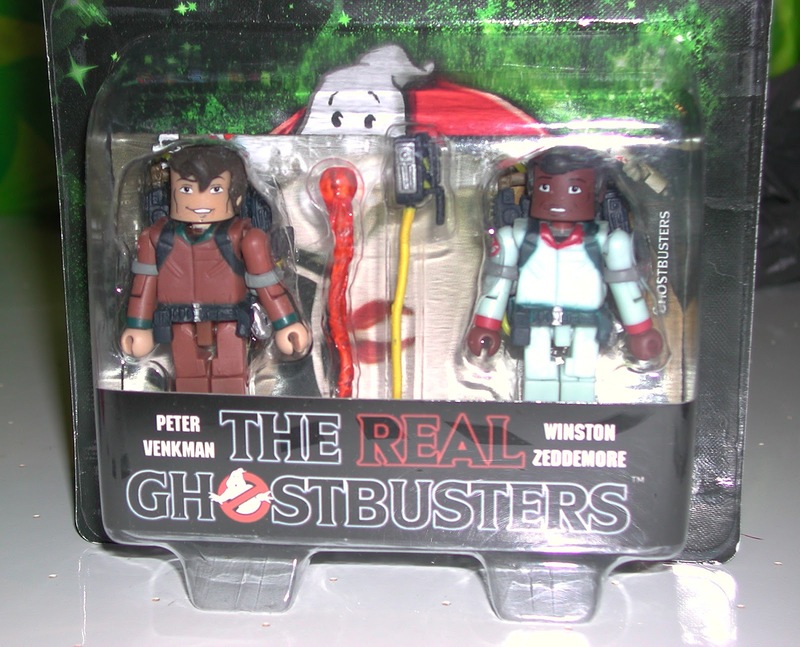 Then we have Peter Venkman and Winston Zeddemore. I love how each Ghostbuster has their own personality and speciality they bring to the team. Peter is very smart, but also very confident and cocky. Winston is loyal, street smart and keeps the team grounded. 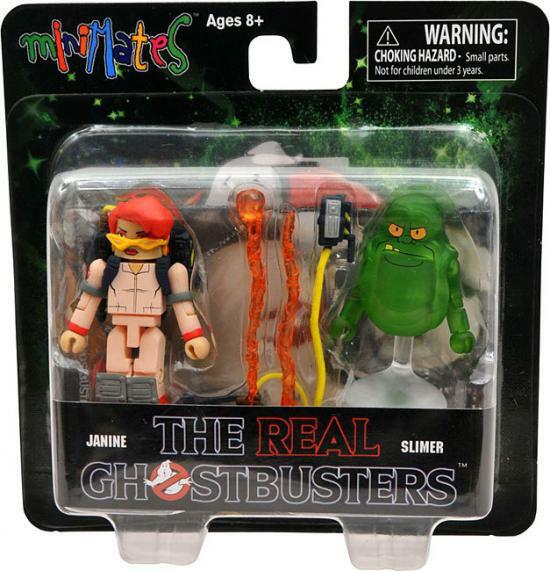 I missed this Janine/Slimer 2-pack and would like to find them eventually. Minimates is a series that is not too expensive and has some great characters. I think I may focus a bit more on collecting these guys? 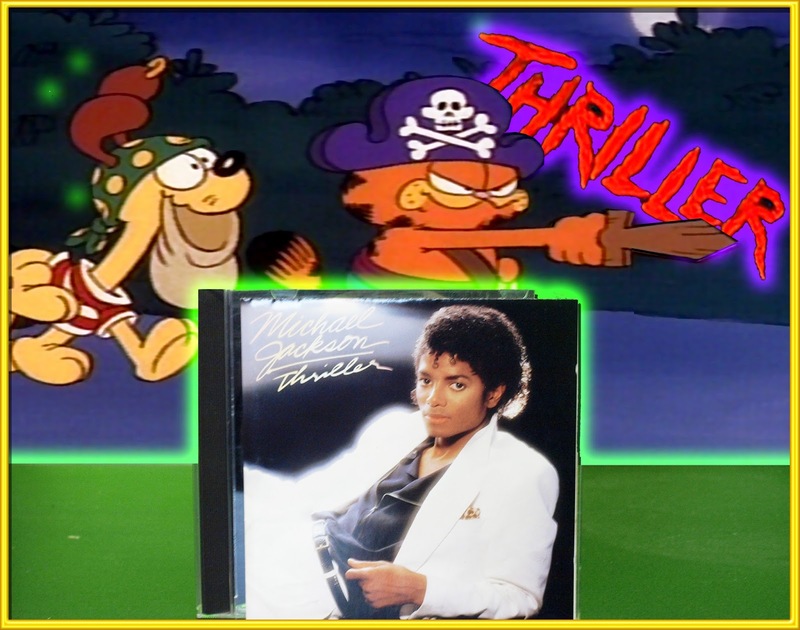 Michael Jackson's "Thriller"! An amazing album featuring the hit songs "Wanna Be Startin' Somethin", "Beat It" and "Billie Jean" to name a few. Any of the songs on this album is a classic, but the one that everyone knows and remembers around this time of the year is "THRILLER"! The song is amazing, but then you pair it with the legendary music video and you have something that has had staying power for generations. The mix of horror, dancing, great music, Vincent Price rapping and Michael Jackson at his peak are a recipe for something special, and we got that on December 2, 1983! 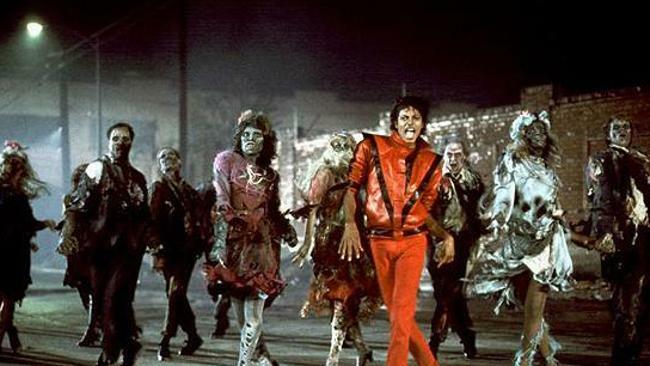 This song is a must play during the Halloween season, so sit back, put on your sequin glove and try to resist the evil of the Thriller! 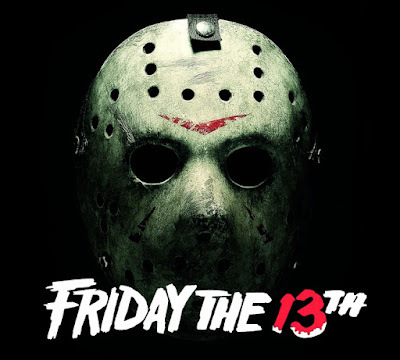 This week the Pop Culture League is asked to blog about "What frightens you the most?". I kind of already talked about this in last week's post about Zombies and my answer would still be the freakin' Tar-Man Zombie from Return of the Living Dead! He is so damn creepy! I was gonna sit this one out, but the more I thought about it, the more some chilling memories came back to me. As a kid we would visit our relatives in Boston every now and then. Lucky for me and my brother our cousin had bunk beds he would let us sleep in. Unfortunately for us his bedroom door had a huge Freddy Krueger poster on the back of the door! 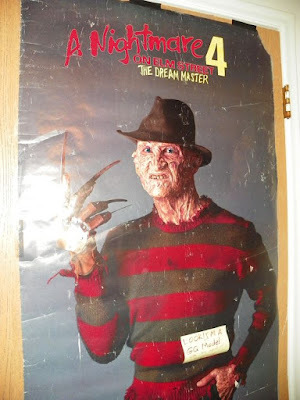 I had seen the Nightmare on Elm Street movies before and really wasn't too creeped out by them, but the thought of Freddy watching over me as I slept in a strange bed in the pitch black, just made my mind race with thoughts of him invading my dreams and eating my soul! Of course I was a 7-year old "Mr. 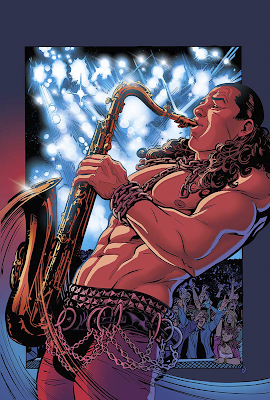 Cool", so I tried to play like it didn't bother me, obviously if I can still remember this...it did! 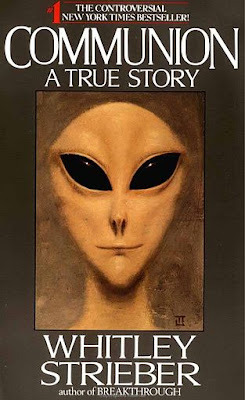 Another thing that messed with me as a kid was the alien on the cover of Whitley Strieber's book "Communion". I think what scared me the most, was that this book is allegedly based on a "True Story"! At 6-years old this depiction of a "Grey" with it's dark black eyes and sly smile made me turn away whenever I saw the displays at Waldenbooks and Borders! The book was turned into a movie starring Christopher Walken. I have never brought myself to watch it. The Toy Box cannot resist the evil of the Thriller! 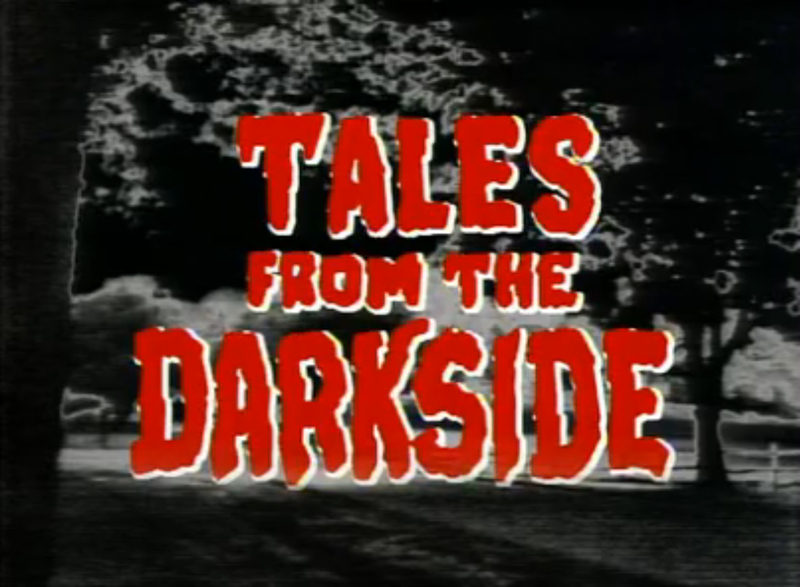 I was about 5 years old when "Tales From The Darkside" was airing on television. Why my parents let me and my brother watch it is beyond me? I know that my Dad watched the show, so they knew what the content was. Maybe they thought we could handle it because we grew up in a time when Freddy & Jason were some of the coolest & most marketable characters around? As a parent today, there is no way in hell I would let my kids watch this stuff! I am over 30 years old and the theme song from Tales still sends chills down my spine! First off, I have to say that I haven't seen the show in decades! Last year I did re-watch the movie around Halloween time. I would like to own the series on DVD someday though and re-live the creepiness. Besides the main theme song there are 3 memories of the show that have stuck with me to this very day. The first is from an episode called "Anniversary Dinner". 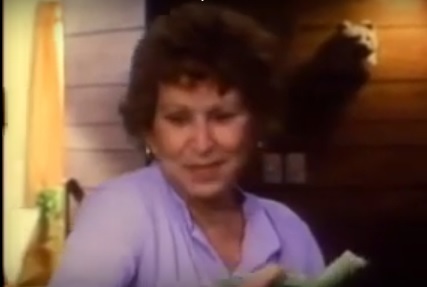 In this episode an older couple takes in a young girl and in exchange for room and board she does some chores around the house. Long story short, the couple is just getting the girl ready so they can enjoy her for their Anniversary Dinner! The memory that sticks out to me most is when the girl is cooked in the old couple's hot tub and the wife throwing vegetables into it to add to the stew. Remember this is a show I haven't seen in years, so forgive me if this description is not accurate. The second memory I have from this show is the crazy talking fruits & veggies from the episode "Love Hungry". In this episode a woman wants to loose weight and goes to extreme measures which leads her to believe her food is a living breathing entity. I thought the sight of the talking food was pretty AWESOME back in the day and I guess it still is! 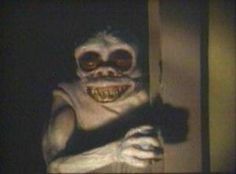 Lastly, this freaky little monster from the episode "In The Closet" creeped me out for years! I would have nightmares that it was under my bed or that shadows in the room were the monster. I'm pretty sure my older brother tricked me into thinking it was real! Once again, WHAT WERE MY PARENTS THINKING!!!! Who am I kidding, I loved this stuff as a kid and can't wait to revisit these classic Tales From The Darkside episodes this Halloween season. The search for the complete series on DVD at Amazon begins! 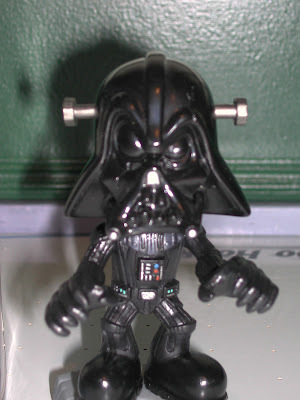 I am a sucker for anything Darth Vader, so when I spotted this Funko Darth Vader Halloween Bobble-Head at Target a few years ago, the debit card came out and he was mine! 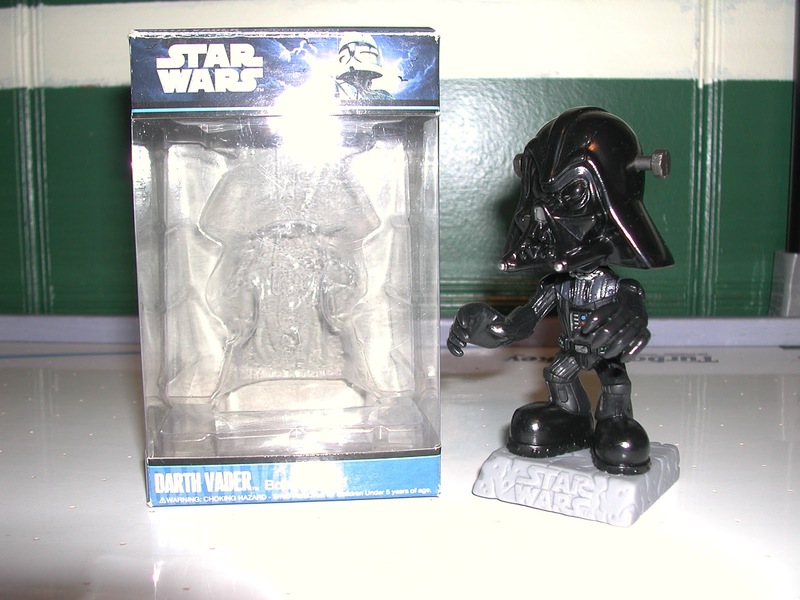 Target typically has fun things like this Vader around Halloween time. 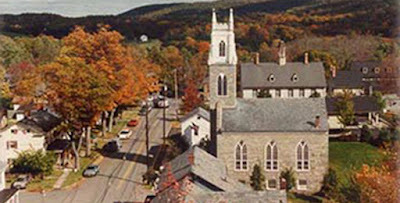 I havn't made it there yet this year, but plan to make a stop soon. As you can see, this is Darth Vader in Frankenstein form! The sculpting is nice and I applaud the added touches like the gnarled "teeth" in his helmet, the head bolts and creepy eyes. 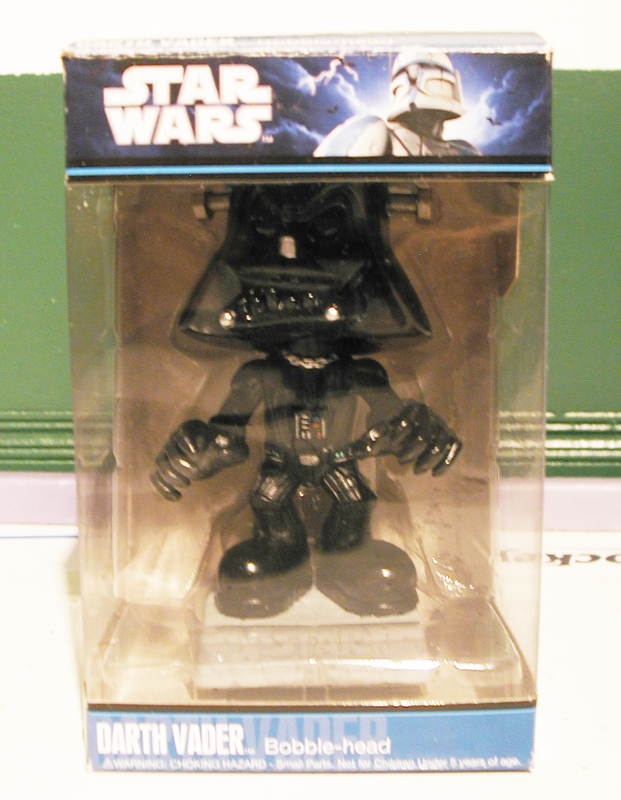 Funko did a great job with this one. Of course there were others in the series including Chewbacca the Werewolf, Zombie Trooper and a creepy Yoda. 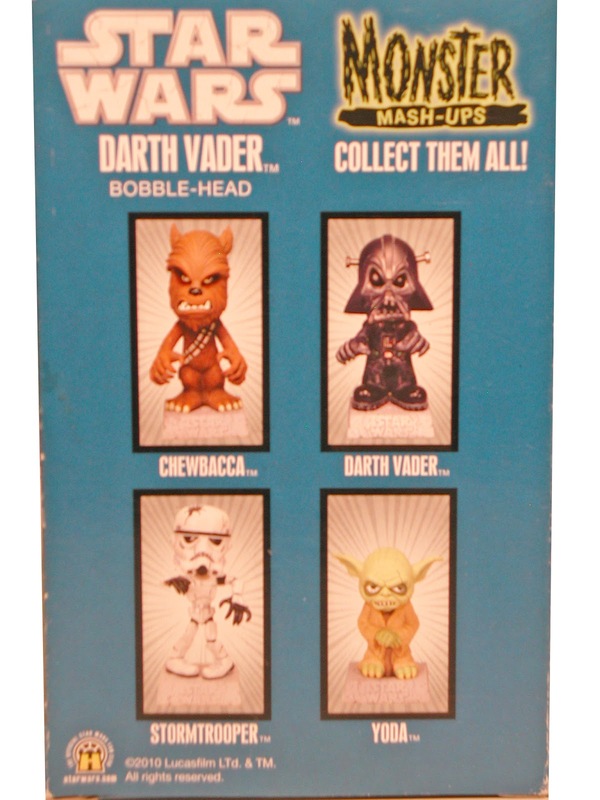 All of these would have been nice to own, but Vader is my Star Wars character of choice and I am glad he is with me and my family for another Halloween season! 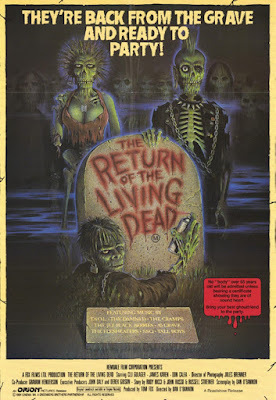 This week the topic for the Pop Culture League to write about is "Zombies: The Dead Have Arisen!". 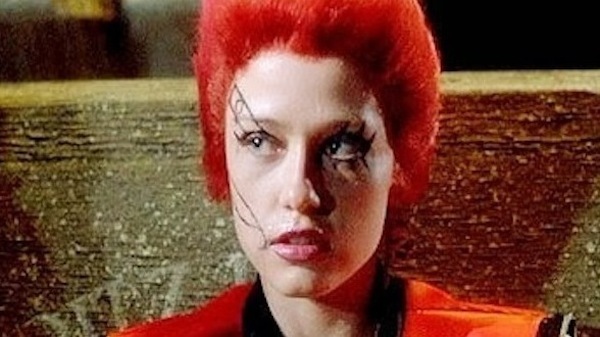 This topic could not have come at a more perfect time as this past Sunday I met an actress from the one movie that really terrified me as a kid..."The Return of the Living Dead"! 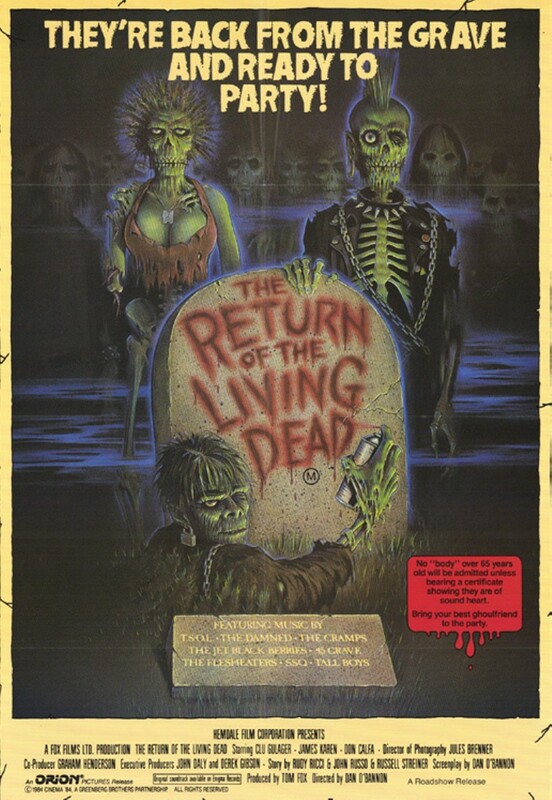 I had seen Friday The 13th, Nightmare on Elm Street, It, Ghoulies and countless other scary movies as a kid, but for some reason seeing the gory imagery from Return of the Living Dead at a young age (around 9 years old) really scared the hell out of me! 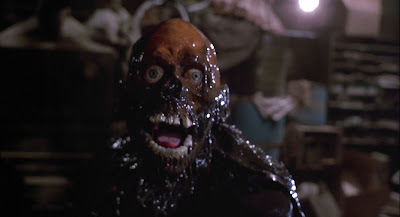 The character that probably gave me the most nightmare induced nights was the damn Tar-Man Zombie. 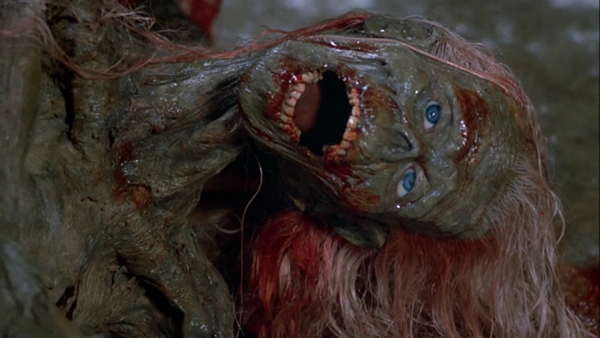 He was so disgusting and his decomposing face yelling for "More Brains" just really terrified me. If there was one monster that could still creep me out today and make me go running for the covers, screaming like a little girl, it would be the freakin' Tar-Man! 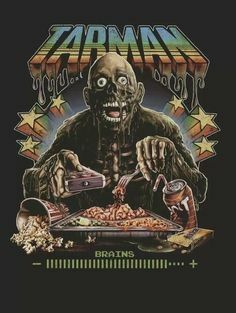 As a youngster I remember flipping through channels on TV and seeing the Tar-Man Zombie pop up and quickly scrolling past it, only to have my brother grab the remote and continuously go back to the movie to see my freaked out reactions. Such a jerk, but I still love my big brother anyway...because my mom says I have to! 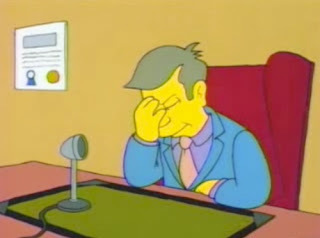 My wife had never seen the movie before, so I'm sure she was enjoying listening me try to describe how 2 bumbling medical supply warehouse workers accidentally broke open a chemical vat that turned a half dog and cadavers alive again, which then led to a cremation of reanimated dead things, which then led to a rain that mixed with the chemicals to cause a Zombie outbreak. I also tried to explain the parts that really scarred me as a kid. This included the scene where a strapped down half of a Zombie explains that eating brains makes the pain of rotting go away! 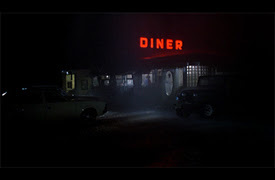 Anyway, it had been years since I was brave enough to watch this film again. So why would I bring up the most traumatic movie viewing experience of my life? 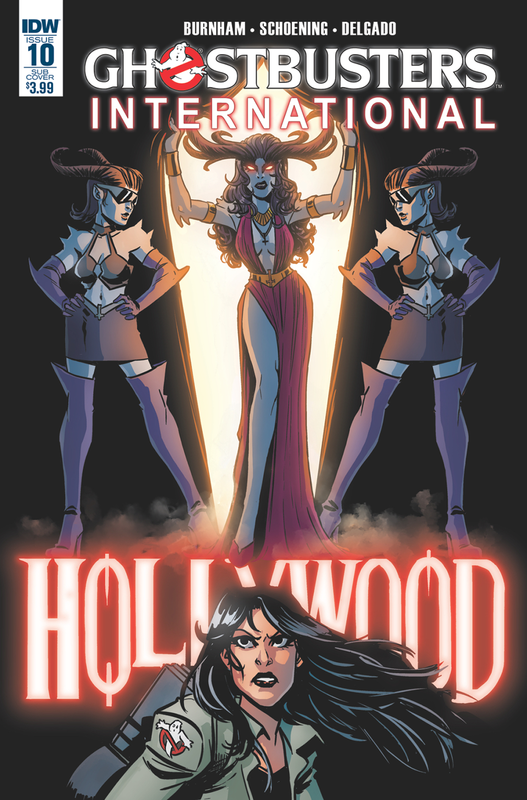 Because my wife had won us tickets to go to Magic City Monster Con where Linnea Quigley aka Trash from Return of the Living Dead would be making an appearance! 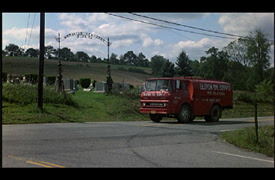 I explained to my wife that her part in the movie was pretty much to get naked and dance in a grave yard. Even though that is what I remember her for, she seemed very nice and was up to discuss everything from her movie roles to dinner recipes. I was surprised that she did not have any copies of Return of the Living Dead at her table to sign. So after the Con, me and the misses went looking for a copy at Wal-Mart & Target with no luck and since Hastings has closed near us, there are no other options to look for this flick in town. Amazon, here I come again! 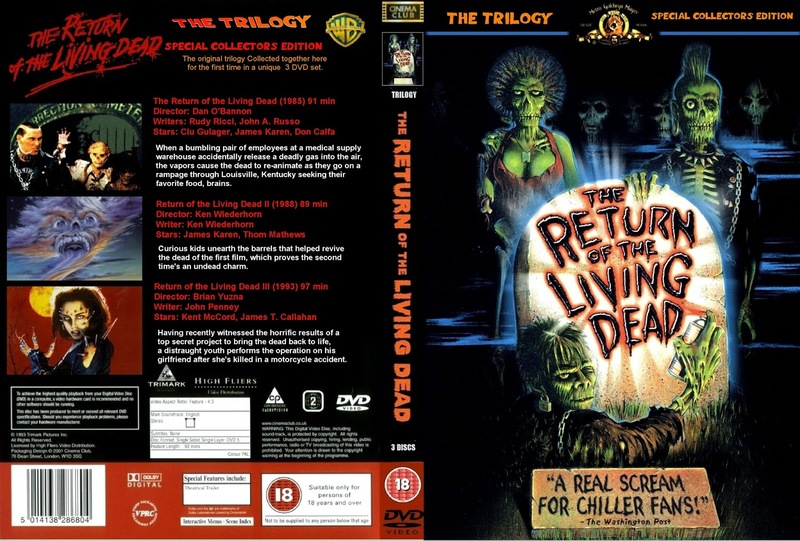 So in closing the Tar-Man is my worst nightmare, my wife listens to my crazy feverish ramblings about old Zombie movies, Linnea Quigley was a nice lady and I am on the hunt for a copy of Return of the Living Dead on DVD! Happy Halloween and try not to have your brains get eaten! Jersey Devil was an action/adventure game released in 1998 by Behaviour Interactive for the Playstation. I enjoyed this game when I first played it on one of those Playstation Magazine Demo Discs. When I found a used copy at GameStop, I immediately picked it up. 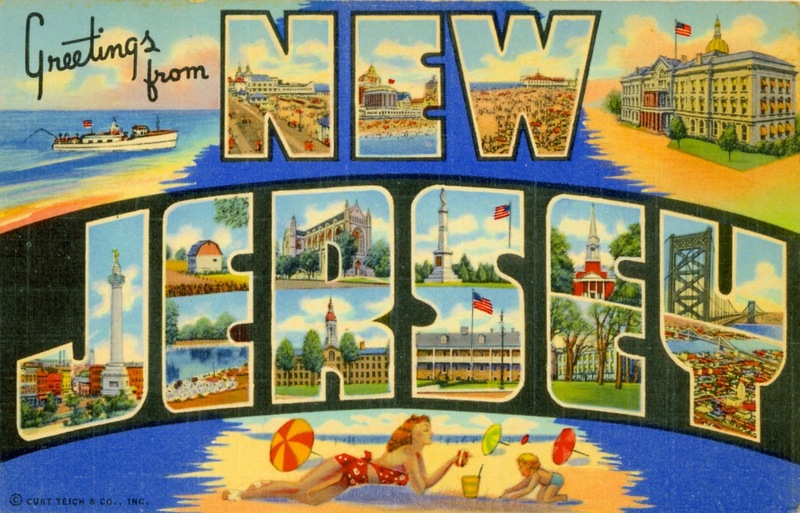 Being from NJ, I loved the history of this elusive cryptid! 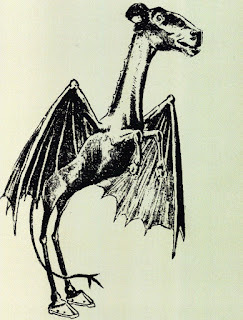 If you don't know the story of the Jersey Devil, here you go: "Mother Leeds had 12 children and, after finding she was pregnant for the 13th time, stated that this one would be the Devil. Mother Leeds was supposedly a witch and the child's father was the Devil himself. 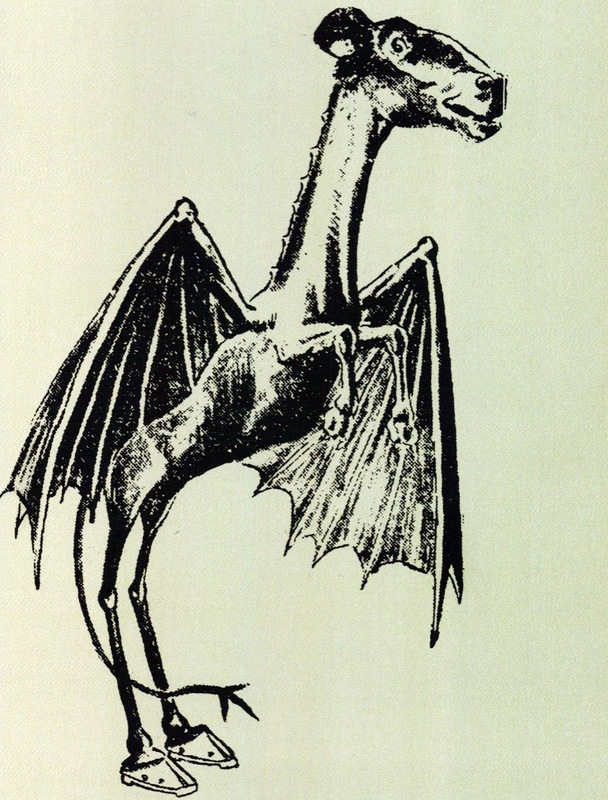 In 1735, born as a normal child, it changed to a creature with hooves, a goat's head, bat wings, and a forked tail. Growling and screaming, it killed the midwife before flying up the chimney, circling the villages, and heading toward the NJ Pine Barrens." This is what he was depicted as in a drawing from 1909! A little different than the hero we got in 1998? 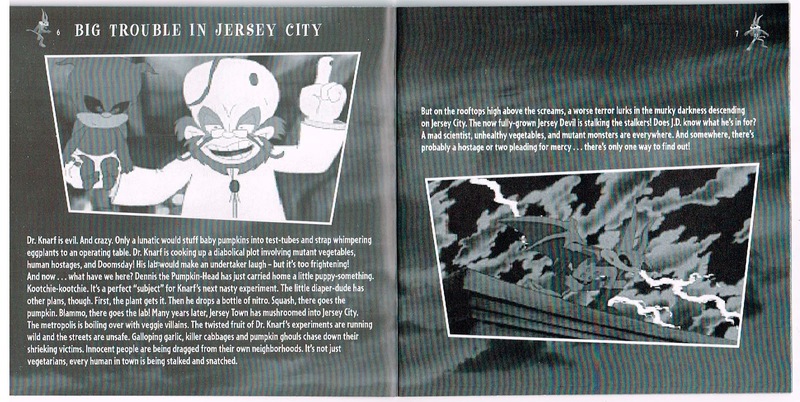 Anyway, the game took place in Jersey City and the Jersey Devil must do battle with the mutant vegetables of Dr. Knarf. Dr. Knarf is using his killer cabbages and pumpkin ghouls in attempt to take over the world! 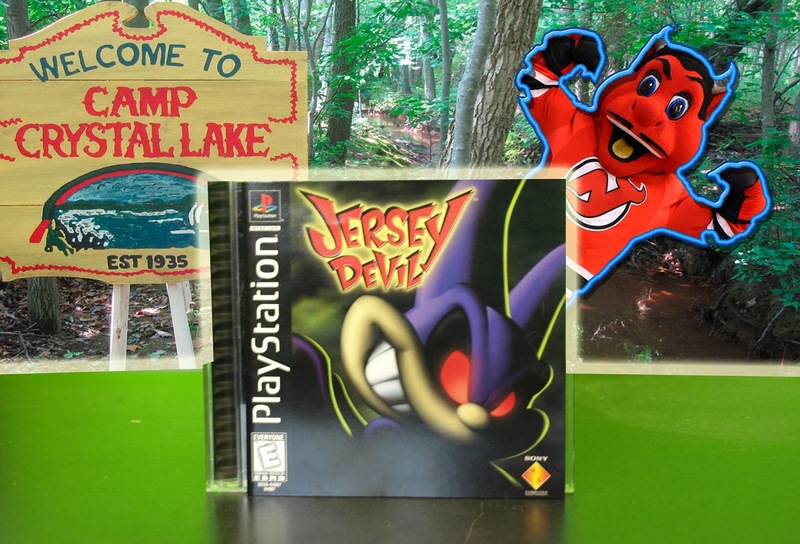 It's up to you and the Jersey Devil to stop him! This game is a lot of fun. 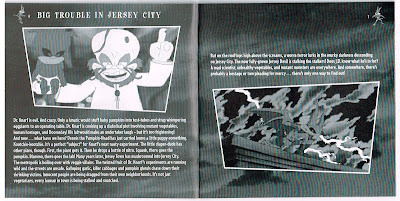 It has colorful characters, a fun story to follow and I really like the way they depict Jersey City in the game. 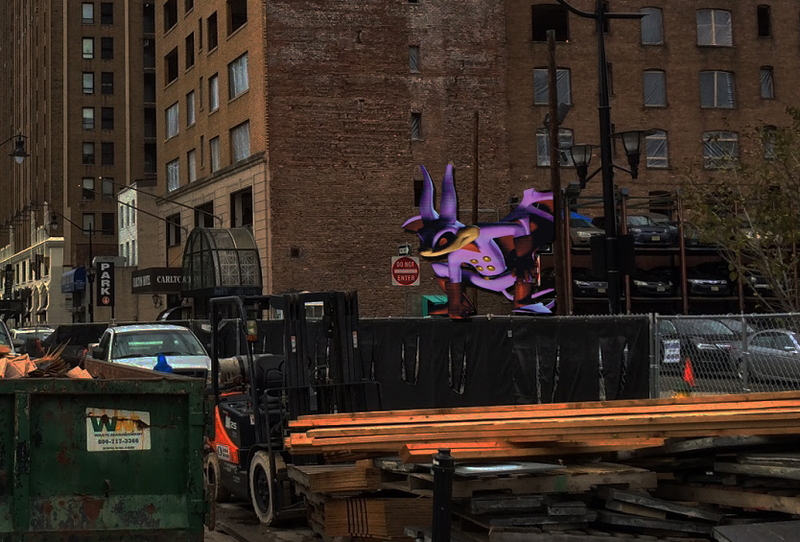 It's just a little different than the one in real life. 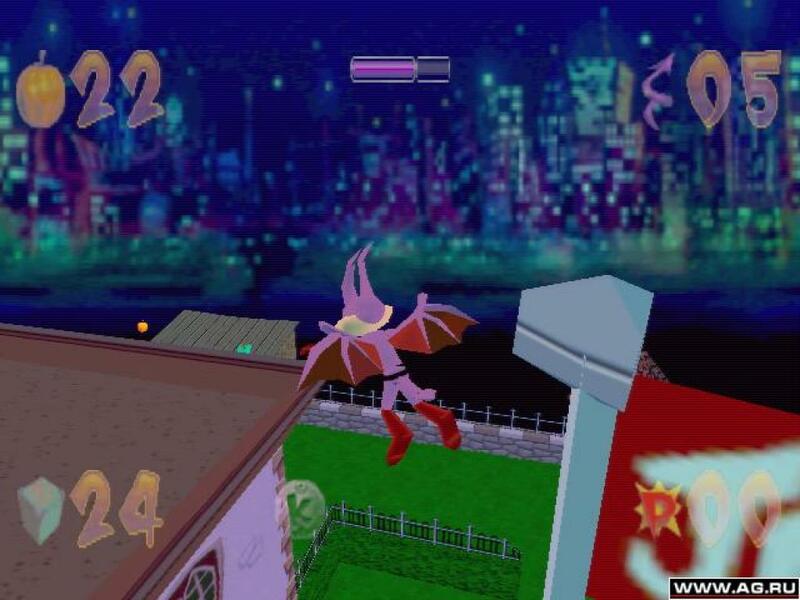 Wouldn't an HD remake be sweet? For now all we have is this Playstation version from '98 and that's good enough for me. I'm gonna try to beat this classic video game this Halloween season! Enjoy this old commercial for the game and take a walk down PS1 Memory Lane with me! 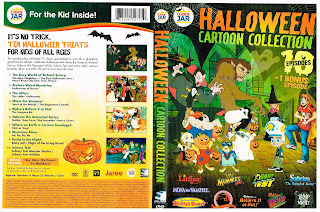 I bought this Cookie Jar Halloween Cartoon Collection about 2 years ago from K-Mart for $5. Our local K-Mart used to have great holiday collection DVDs like this one for cheap. Unfortunately, last month the store closed. A sad, lost relic of days past in it's own right, K-Mart just could not keep up with the Targets and Wal-Marts of the world. I have great memories of shopping there and eating at the K-Mart café in the Hackettstown Mall. Anyway, let's get back to the DVD! 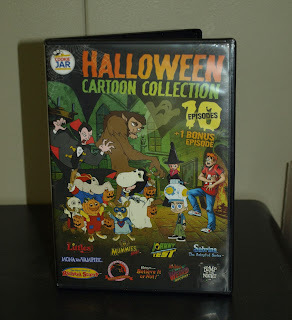 This thing is jam packed with solid cartoons from the 80s & 90s. 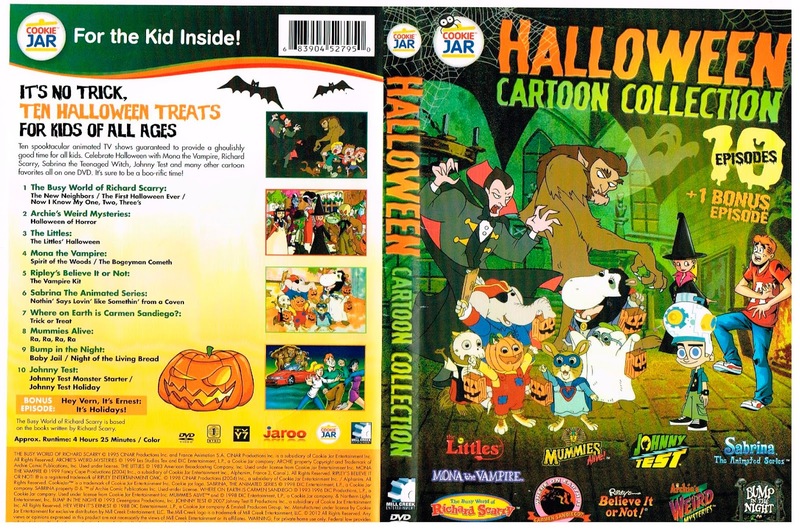 The Halloween Collection includes 10 episodes of Halloween fun including my favorites The Littles, Sabrina: The Animated Series and Mummies Alive! 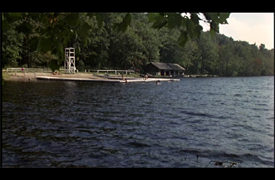 If that wasn't enough, there is a bonus episode of Hey Vern, It's Ernest included! My head just exploded! It's a nice collection of old school toons for a small price to enjoy during the spooky season! Now relax and enjoy the "Night of the Living Bread" episode of the 90s classic cartoon, Bump In The Night!